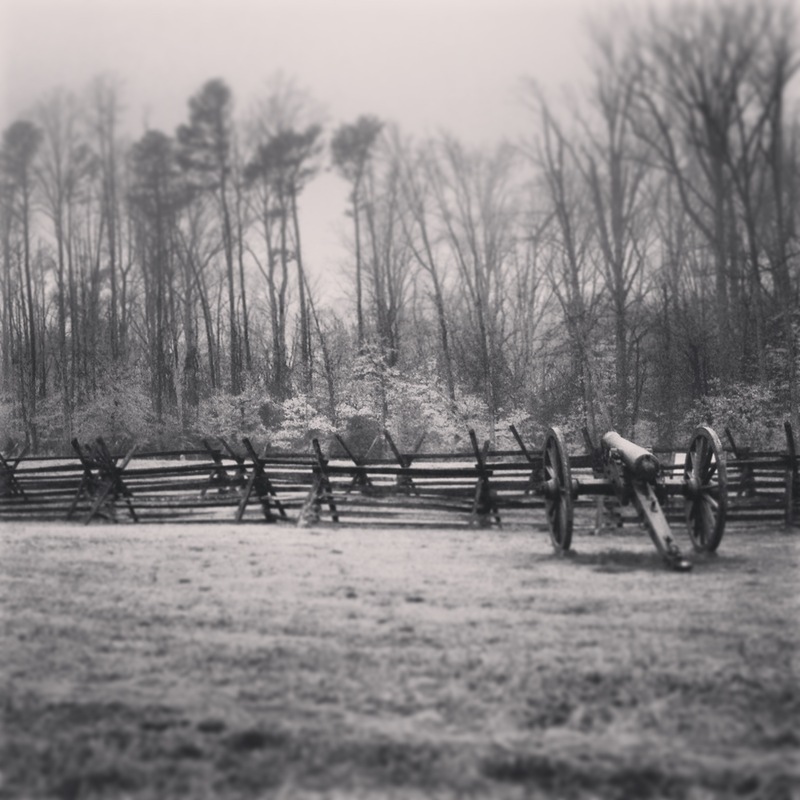 An “antiqued” image of the Gaines Mill battlefield. 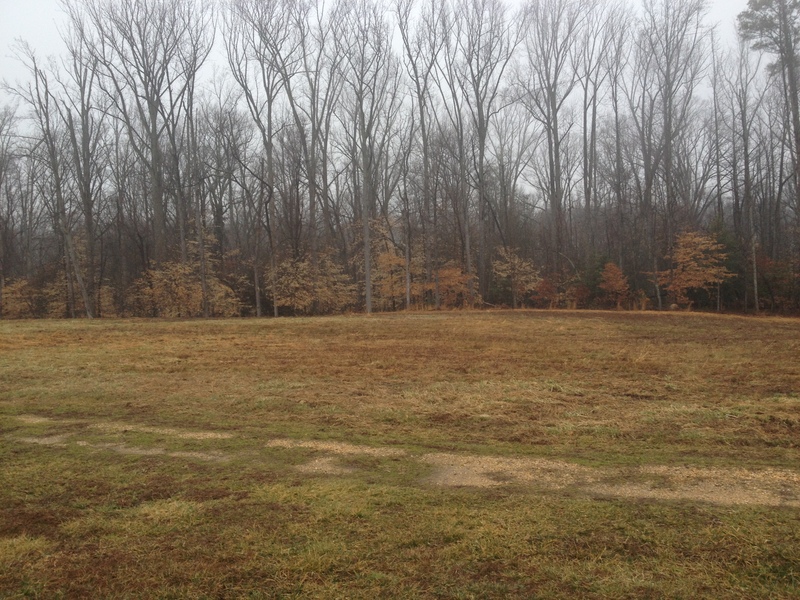 The 22nd Massachusetts was first posted in the woods in the distance and then fell back to the position of the battery. For a good number of years now, I have from time to time walked in the footsteps (both literally and figuratively) of a man named John F. Dunning. Born in Brunswick, Maine in 1832, he was a carpenter who moved to Boston in 1859 and signed up with the Massachusetts militia as Civil War began to look inevitable. I have tried to learn all I can about him. How strange he would probably think it if he could have known that more than 150 years after his death, someone would be walking in his footsteps. Civil War reenactors, for the most part, do not do “first person” portrayals…that is, we don’t pretend to be people we are not…contrary to what most comedy sketches might depict. First person portrayals are at times appropriate for certain presentations or scenarios. But the majority of reenactors do not sit around the campfire being “in character.” We generally try to interpret history on a group level and not a personal one. That said, I think many reenactors do select a historical person whom they wish to represent, if only in name. This is not a matter of being in character, you are simply filling their shoes, so to speak. I am captain of the recreated 22nd Massachusetts Infantry, Company D. The original captain was John F. Dunning. And so, by default, I represent him. I’ve read articles he wrote as a war correspondent for the Boston Post (discovered by an excellent researcher in our unit…thanks, John). I’ve stood outside the site of his Company D recruiting office in Boston. I took part in a reenactment of the Battle of Gaines Mill last year where our company had the remarkable opportunity to faithfully recreate the actions of the 22nd Massachusetts during the engagement in which Dunning met his fate. And I’ve made the long trip up to Brownville, Maine with members of my company to render a salute at Dunning’s grave and presented a copy of his portrait to the Brownville Historical Society. But I had never been to Gaines Mill in Virginia where Dunning fell. This I had been wanting to do for years. Several weeks ago, that opportunity finally presented itself. Ruins of Gaines’s Mill in 1865. Note the skull in the foreground which is, I would guess, a casualty of the Battle of Cold Harbor in 1864, fought nearly on the same ground as the 1862 Battle of Gaines Mill. The site of Gaines’s Mill today. I would bet somewhere in the briar and thicket, some bricks and stones remain, but it is private property with houses hard by and I did not dare venture to look. …I can truly say that I do not believe there is a company in ours, or any other Mass, regiment, wherein exists between men and officers so pleasant and friendly relations…The result of this is that each feels a pride in the company, and for order and discipline we will acknowledge ourselves second to no other in the regiment. This state of things has been brought forth by the energetic action of our Captain, John F. Dunning, of Boston—a man whom all the company love and respect, and whom they will follow wherever he may lead. By his example…he has inaugurated a system of discipline, which, while it entirely ignores the usual domineering style most commonly in vogue, still rigidly exacts and receives prompt, and what is better, willing obedience…Not only by these efforts in their behalf, but by a constant watchfulness over their comfort, has Captain Dunning won for himself a place in the hearts of his command which any leader might envy. High praise indeed. I am relieved, frankly, that my counterpart was not notorious. I won’t go into great detail on the build up to the Battle of Gaines Mill, but to make a long story short…General Robert E. Lee took command of the Confederate Army in Richmond in June 1862 and decided to strike first at the right flank of the Union Army. This flank happened to be the V Corps (of which the 22nd Massachusetts was a part). The V Corps was separated from the rest of the Army of the Potomac by the Chickahominy River, and so they found themselves in the unfortunate position of attempting to make a stand near Gaines’s Mill, with their backs practically against the Chickahominy. It was one of the more lopsided battles of the war with roughly 27,000 men of the V Corps facing 60,000 Confederates…that was most of Lee’s Army. 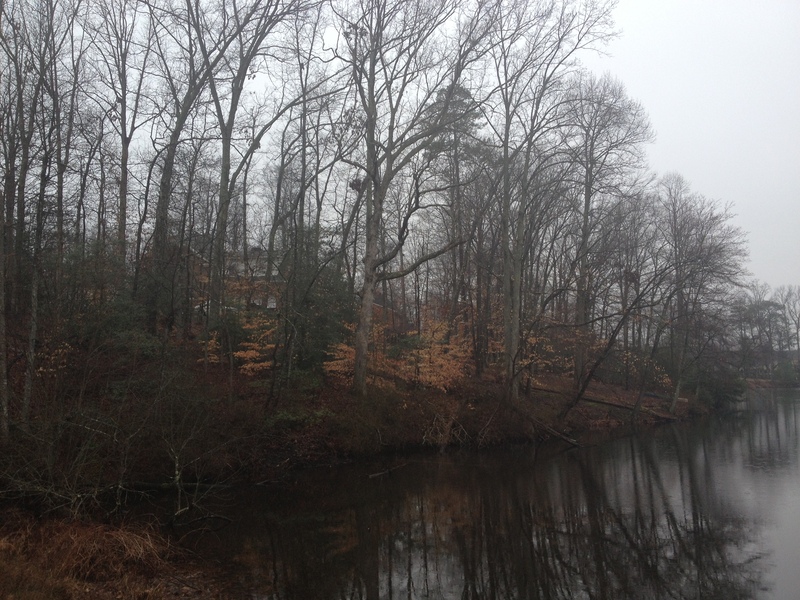 The hill by the millpond, relatively close to where the 22nd Massachusetts camped. The mill itself was on the other side of the hill. There are many houses here today and this shot was carefully taken so as to exclude them. My first stop on this pilgrimage was to look upon the site of Gaines’s Mill itself where the 22nd Massachusetts had camped for so long. The millpond is still there, probably looking much as it did in 1862. The mill is entirely gone, but marked. Somehow I had envisioned the entire area being very rural, but to my surprise there was a large suburban development completely surrounding the millpond. Driving around the millpond and up the hill where the 22nd camped, I looked at the tidy, modern houses and wondered if the residents knew that thousands of men had been encamped all over that neighborhood. I imagine that sort of thing just comes, literally, with the territory in greater Richmond. The mill site, being not exactly what I envisioned, was a bit underwhelming. It was really impossible to get an idea of how the area looked in Dunning’s time. And so it was time to move on to the battlefield itself. In every camp sacrificial fires were offered to the gods of strategy and military necessity, fed with commissary and quartermaster’s stores…The view presented by our late so pleasant camp, in this and other respects, occasioned by our so sudden “change of front to rear,” was, to a casual observer, rather dispiriting, conveying the idea of an utter rout…However, not long were we allowed to ponder over these matters, for time was pressing on, and so was our eager and determined foe. Accordingly, at about nine o’clock in the morning, we were marched to our position on the top of the hillside, facing Dr. Gaines’s house, and began making arrangements for giving our expected visitors a warm reception. The battlefield where this “warm reception” took place, one mile south of Gaines’s Mill, is well preserved by the National Park Service (and just recently the Civil War Trust acquired an additional 285 acres of the battlefield…an effort which the 22nd Massachusetts was proud to support). My first thought upon arriving there was how very much it resembled the ground where the reenactment had taken place last year (even though the reenactment was in Pennsylvania and not Virginia). The coordinators of that event had chosen their ground well. The brigade to which the 22nd Massachusetts belonged occupied the woods at left, then fell back to the farm lane at right. The 22nd Massachusetts regrouped near the Watt Farm which can be seen in the distance at right. I knew roughly where the 22nd Massachusetts had fought during the battle, and so I made my way directly there. I had always imagined that I would visit the spot in the summer when the leaves were full and the air heavy…just as things had been during the battle on June 27, 1862. The day I was there, being late February, was chilly and raw. The trees were bare. It was raining just slightly and the fog which clung to the treeline eventually, quite slowly, overtook the field during my visit. An eerie sort of thing, frankly. The whole atmosphere was not what I had imagined, but somehow it seemed perfect. The initial awe and quiet observation was soon followed by a good deal of pacing around and some frustration on my part. On the major battlefields, the positions of various units are often clearly marked. 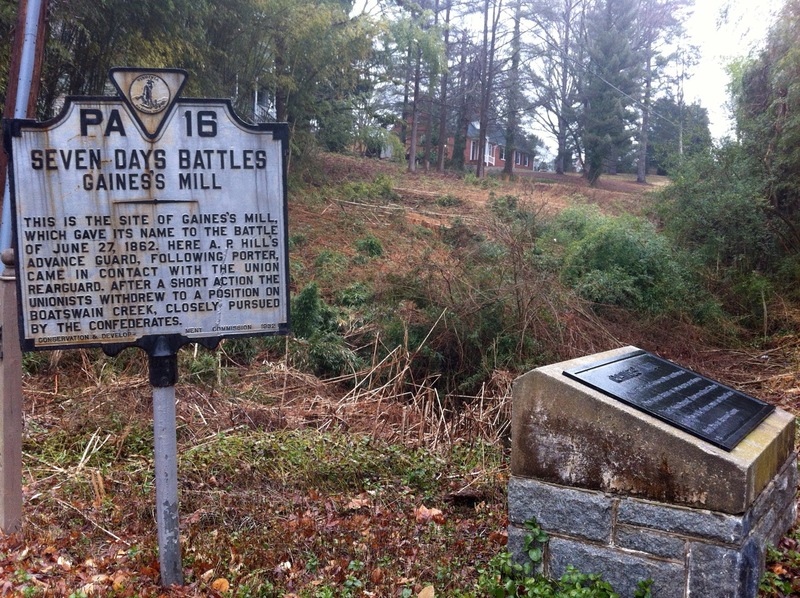 This is not typically undertaken at lesser known battlefields like Gaines Mill…which is generally a good thing…but it presented a problem for someone like me in search of a precise spot. I knew, in a lateral sense, what part of the line the 22nd Massachusetts occupied. But I could not quite figure how far forward their position was and where they built their breastworks. I confess, I fancied that I would almost “know” the spot…but there were no such monitions. I walked forward to the woods, then back to the snake rail fence where stood two cannons, then further back to another tree line. All this quite close to the Watt House, a tidy little dwelling which stood there during the battle, has been rather altered from its wartime appearance, but is now well-kept by the NPS. Various accounts and maps of the battle agree that the 22nd Massachusetts fought just left (west) of the Watt House. I knew I was roughly on the right ground. But I wasn’t really getting a sense of where the 22nd Massachusetts made their initial stand. 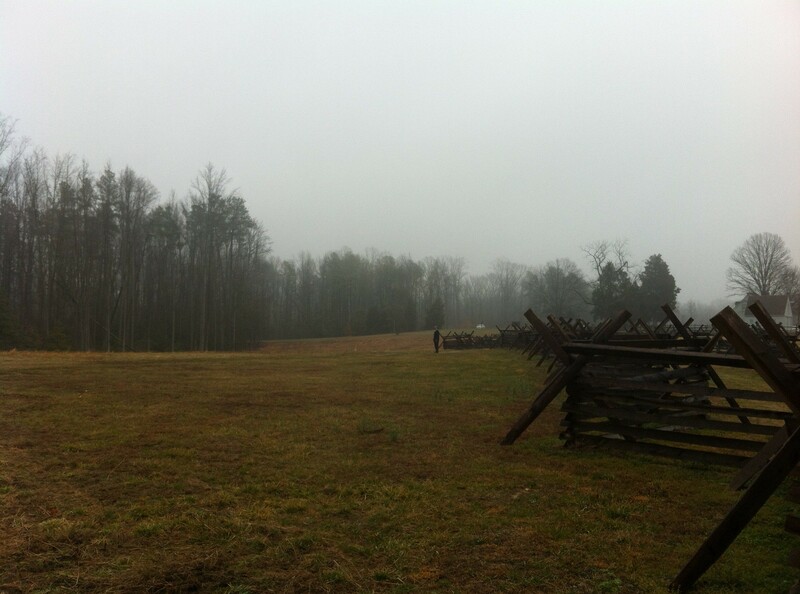 The Confederates launched uncoordinated attacks against the Union position several times over the course of the afternoon but were repelled each time. Then came a lull while General Lee organized what would be the largest Confederate assault of the entire war. At 7 pm, 32,000 Confederates attacked simultaneously in the twilight, sixteen brigades of them, utterly overwhelming the Union line. Our Sergeant Scott wrote, “…thus they swept on over the hill side, which was soon one solid mass, pressing on to overwhelm us, not by fighting, but to crush us by the mere force and weight of numbers…we were kept lying down in our places…but by looking in the face our Colonel, who occupied a pine in the rear of the centre…I could see how the fight was going, for his countenance was a complete daguerreotype of the battlefield. Alternate light and shade, always tinged with anxiety, showed me all that I required.” The 22nd Massachusetts rose up as the assault reached their breastworks and gave the Confederates a volley…and then were quickly overrun. The woods in which the 22nd Massachusetts built their breastworks, prepared to meet the Confederates, and were badly overrun. Sources suggest that they were just on the edge of these woods with their backs towards the camera, so to speak, but they might have been further in. Captain Dunning, according to various sources, was shot in the head and chest very early in the assault. So, he fell at the regiment’s most forward position, somewhere just inside the woods. I could not get a sense, when I was there, how far into the woods they had been posted. And so the spot I was looking for seemed elusive. A little frustrating even now as I think about it. Gaines Mill was the worst fight of the entire war for the 22nd Massachusetts. The regiment went into the battle with roughly 600 men. They came out with half that number. Only one regiment (the 83rd Pennsylvania) suffered higher casualties that day. It was a bit overwhelming, standing there on the ground over which I knew the 22nd Massachusetts retreated, imagining the chaos. A large number of the regiment were captured. 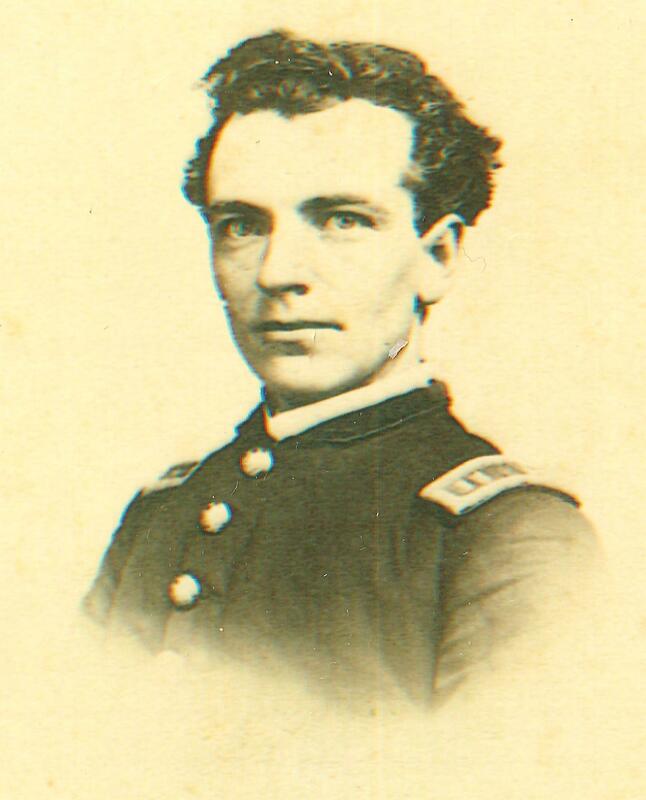 Corporal John L. Parker, who would become the regimental historian, was shot in the leg and left on the field. Lying there, probably within the view of the above photo, he saw a Confederate soldier approach Captain Dunning’s body and take his two pistols. The same Confederate then took Parker prisoner by striking him on the head with Dunning’s revolver…a bitter irony. These and numerous other scenes of which I’ve read came to mind as I looked on that field. As I walked back towards the car, I felt rather certain that I had finally done it…been to the spot where Dunning fell. Only I didn’t know exactly where. But I felt sure that at some point, without actually knowing it, I had passed by the place for which I was looking.